Miss Emily R. Livingston, of near Sulphur Springs, and Ross B. Stanton, of Jerome, Somerset county, were married last evening by the Rev. Tobias F. Henry, pastor of the Sell-street Church of the Brethren, the ceremony having been performed at the parsonage, 1337 Roxbury avenue. The bride is a daughter of Mr. and Mrs. Jacob Livingston, of Conemaugh Township, and Mr. Stanton is a son of Mr. and Mrs. Charles Stanton, who reside near the Hopewell M. K. Church in Jenner Township, where the newlyweds will make their home. Miss Theresa Covina, daughter of Mr. and Mrs.. Frank Covina, and Guy Anastazi, both of this city, were united in marriage last Sunday afternoon in St. Anthony's Italian Catholic Church, Maple avenue. The Rev. Father Anthony Balestiere, T. O. R., rector, officiated at the nuptial mass. 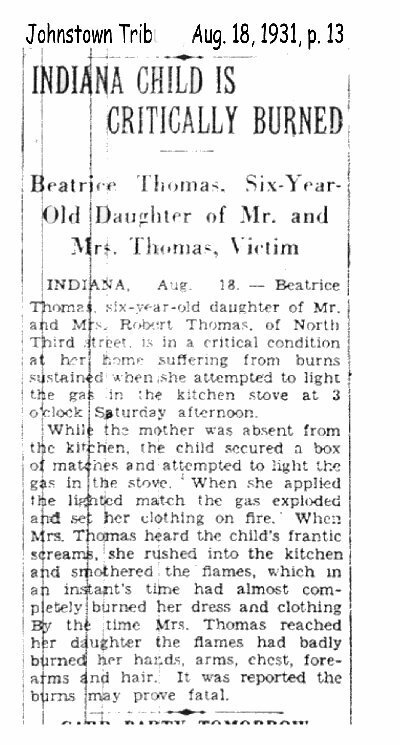 INDIANA, Aug. 18,-- Beatrice Thomas, six-year-old daughter of Mr. and Mrs. Robert Thomas, of North Third Street, is in a critical condition at her home suffering from burns sustained when she attempted to light the gas in the kitchen stove at 3 o'clock Saturday afternoon. While the mother was absent from the kitchen, the child secured a box of matches and attempted to light the gas in the stove. When she applied the lighted match the gas exploded and set her clothing on fire. When Mrs. Thomas heard the child's frantic screams, she rushed into the kitchen and smothered the flames, which in an instant's time had almost completely burned her dress and clothing. By the time Mrs. Thomas reached her daughter the flames had badly burned her hands, arm, chest, forearms and hair. It was reported the burns may prove fatal. Miss Agnes A. McDonough, daughter of Mrs. T. B. McDonough, of the King Edward apartments, Pittsburg, and Attorney Hugh C. Boyle, son of M. J. Boyle, of 321 Tiogra street, Westmont, will be married next Wednesday morning at a nuptial mass in St. Paul's Cathedral, Pittsburg. Their attendants will be M. J. Boyle, Jr., of this city, and Miss Martha Raab, of Wheeling, W.Va. Bishop Hugh C. Boyle, of the Pittsburg diocese, an uncle of Attorney Boyle, will officiate. Attorney Boyle has been located in Pittsburg since his graduation from college. They will make their home in Pittsburg. A large number of Johnstown friends and relatives will attend the wedding. REV. ROBERTS TO BE SPEAKER ON MONDAY. Outstanding events of 1931 will be reviewed by the Rev. J. Rhys Roberts, pastor of the Westmont Presbyterian Church, in a paper to be presented before the Johnstown Ministerial Association at its meeting at the Y. M. C. A. at 10 o'clock Monday morning. The Rev. W. A. Blackwell will be the devotional leader.